to promote his book (Author photo). A new biography of John Sevier is always interesting to anyone attracted to Tennessee history, and especially those people of Upper East Tennessee who care about the history of the lost state of Franklin. 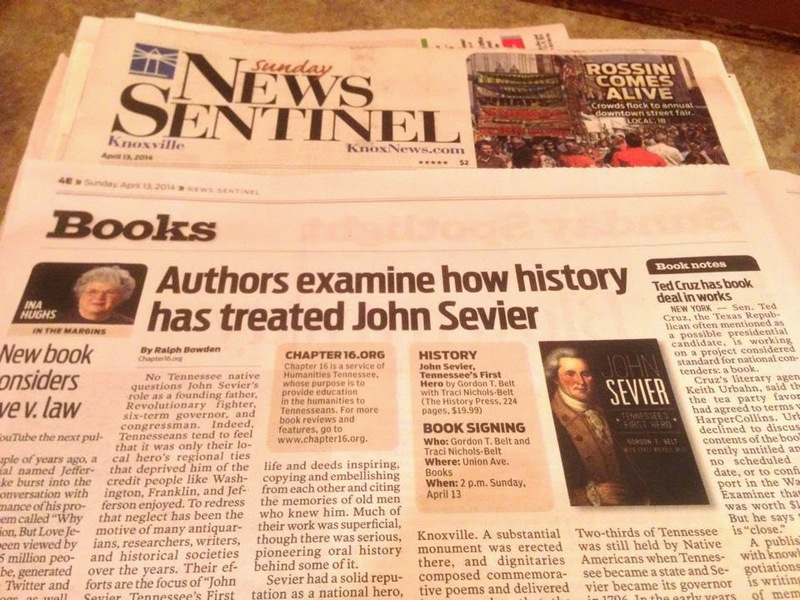 That alone makes Gordon T. Belt’s latest work, “John Sevier: Tennessee’s First Hero” a valuable contribution. But Belt’s book, published by The History Press, is not just a retelling of the extraordinary exploits of the frontier leader who became Franklin’s only governor and the first governor of Tennessee. The book is also a historiography of the Sevier story, from his contemporaries to the state’s earliest historians to Theodore Roosevelt to the recent outdoor dramatists. Belt is well-equipped for the task. A native Tennessean who holds a master’s degree in history from Middle Tennessee State University, he is the director of public services for the Tennessee State Library and Archives. He previously worked as the library manager for the First Amendment Center. Belt is also past president of the Society of Tennessee Archivists and holds memberships in the Society of American Archivists, the National Council on Public History and the Tennessee History Society. His wife, Traci Nichols-Belt, is coauthor of the book. She also holds a master’s degree from Middle Tennessee State University and is an ordained minister. She is a public speaker whose primary research is in religion in the Civil War. Belt has been writing about John Sevier’s history for a long time through his Internet blog, The Posterity Project, at http://posterityproject.blogspot.com. In the blog, Belt has worked to cut through the myths and legends told by the early settlers and try to understand Sevier. Belt said it is the earliest part of Sevier’s life, the pioneer part, that is most filled with myth and legend. Early historians of the state, including Judge John Haywood and J.G.M. Ramsey, used this oral history derived from surviving contemporaries of Sevier to tell the story of Sevier’s early life. His career as a soldier, from Kings Mountain to his 35 victories over the Cherokee in 35 campaigns, were so noteworthy that there are plenty of comments, even from George Washington. Naturally, Sevier’s career as a politician is well-documented, Belt said. Sevier’s role as the state’s first hero has been uneven, Belt said during the interview. Certainly, he was admired by his contemporaries, who elected him governor six times and sent him to Congress in his final years. But Sevier’s story quickly became overshadowed by the success of Andrew Jackson. Sevier died in Alabama in 1815, the same year as Jackson’s victory at the Battle of New Orleans. Belt said Sevier remained in his Alabama grave for 74 years, until the state needed its first hero once again. Belt’s biography is unusual in that much of it tells about a time much after the hero’s death. It was the time after the Civil War, when the nation was looking for ways to heal the breach and bring a divided people back together. Belt has written a biography in which he wanted to present a “warts and all” description of an important man. He has also written about a hero who has been and continues to be an inspiration to Tennesseans. Sunday edition of the Knoxville News-Sentinel (Author photo). No Tennessee native questions John Sevier’s role as a founding father, Revolutionary fighter, six-term governor, and congressman. Indeed, Tennesseans tend to feel that it was only their local hero’s regional ties that deprived him of the credit people like Washington, Franklin, and Jefferson enjoyed. To redress that neglect has been the motive of many antiquarians, researchers, writers, and historical societies over the years. Their efforts are the focus of John Sevier, Tennessee’s First Hero by Gordon T. Belt and Traci Nichols-Belt. The actual historical figure of John Sevier, who lived from 1745 to 1815, takes a back seat in comparison. Many of the early written works covering Sevier’s career included poorly documented stories that were essentially myths, like Washington’s cherry tree. These first biographers offered what amounted to hagiographies, tales that augmented Sevier’s charisma and leadership abilities, his courage in confronting the “savages,” his vision in trying to develop the trans-mountain frontier. For such writers, history was supposed to be didactic, so they made Sevier’s life and deeds inspiring, copying and embellishing from each other and citing the memories of old men who knew him. Much of their work was superficial, though there was serious, pioneering oral history behind some of it. Sevier had a solid reputation as a national hero, thanks to his leadership at the American Revolution’s Battle of King’s Mountain. His attempt to organize the State of Franklin from the westernmost counties of North Carolina was often interpreted as an extension of the Revolutionary determination to throw off distant and arbitrary government. As a leader in the westward-expansion movement, he later appeared as a hero in Theodore Roosevelt’s books promoting manifest destiny. The patriotic pride characteristic of the later decades of the nineteenth century revived interest in Sevier as well. His bones were removed in 1889 from Alabama, where he died, to a suitable resting place in Knoxville. A substantial monument was erected there, and dignitaries composed commemorative poems and delivered long speeches that the Belts faithfully include in their narrative. The Belts, by concentrating on the Sevier historiography, have demonstrated again how history is anything but a recitation of the documented facts. Nor is it immutable. It always reflects the motives of the people generating it, which, in turn, reflect their times and cultural circumstances. John Sevier was a pioneer, Revolutionary War soldier at King's Mountain, Indian fighter, leading figure in the State of Franklin as well as Tennessee's first governor. Born in 1745 and died in 1815, his extraordinary life of 70 years was not short for the perilous time period in which he lived. Originally buried in Decatur, Alabama, in 1889 he was reinterred in Knoxville. A monument was erected to him in Nashville's Old City Cemetery in 1851. Sevier was not without enemies and detractors in his day, but in later years his memory became revered and sometimes misrepresented by those wanting to honor his patriotism. The authors bring new and long forgotten information to light in this interesting study on John Sevier. Anyone curious about the early history of Tennessee, and ways an image can be polished over time, will find this book fascinating. The Middle Tennessee Journal of Genealogy & History is an award-winning quarterly, with articles of genealogical and historical interest. 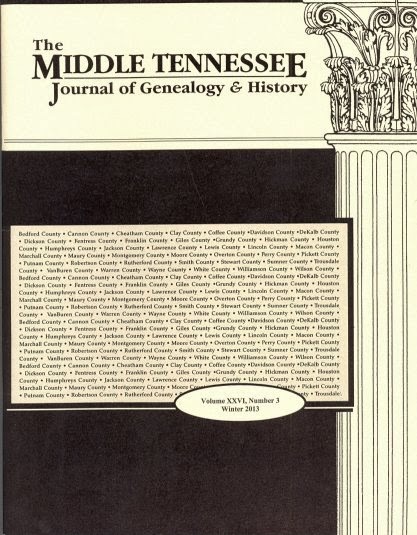 The Journal is mailed to all Middle Tennessee Genealogical Society members in good standing. Little-known Tennessee records are published and indexed, along with family genealogies, Bible records and material submitted by members. Book reviews are published January, April, July and October. An index to previous issues of the Journal can be found on the MTGS website at: http://www.mtgs.org/journal/default.html.